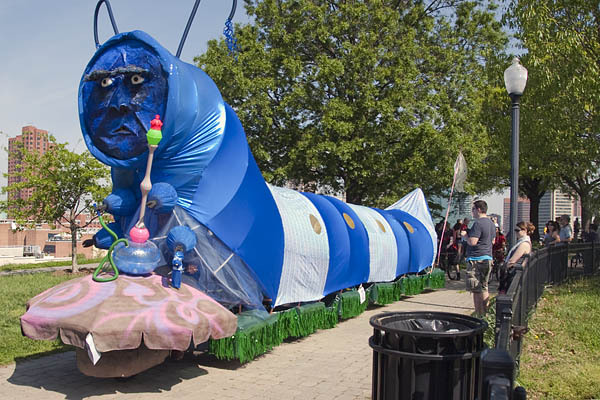 Winner of both the People’s Choice and Pilots’ Choice was this stupendous blue caterpillar from Alice in Wonderland known for smoking a hookah, and whose three inch-height grows in significance when Alice is small. 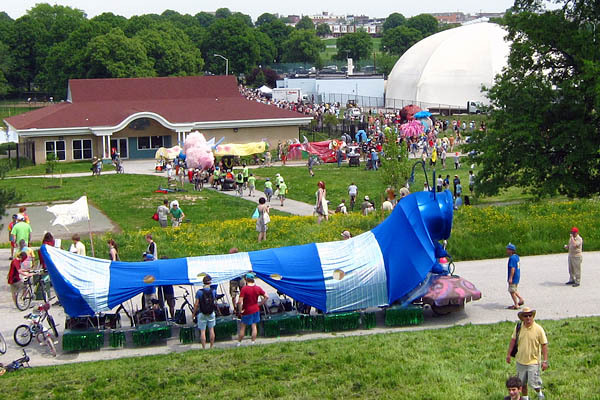 To the left, the Caterpillar and its dramatic shadow leave the starting line at the American Visionary Art Museum (AVAM). 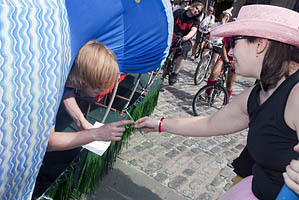 To the right, it arrives at a checkpoint at which a pilot was required to create a sketch in the theme of their sculpture. The otherworldly blue face and body contrasted dramatically with green foliage and the pale blue sky. 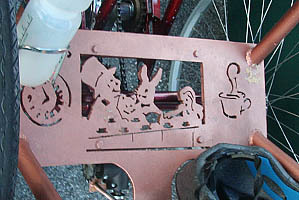 Inside the caterpillar and invisible when the Caterpillar was in motion, etchings showing scenes from the story were embedded in the sculpture’s chassis. The sculpture came from the team responsible for 2009’s Air Cosmonauts who run Mr. Rain’s Fun House, AVAM’s new restaurant. 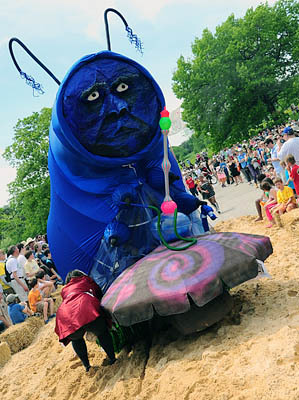 As Fifi joins the other 6-pilot caterpillar in this year’s race heading toward the mud, the Caterpillar took a break before bypassing the mud altogether. 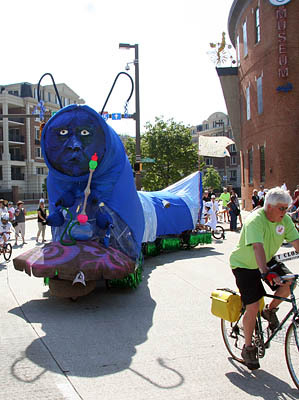 Speculation was high that if the Caterpillar had conquered the mud, it might have won the Grand Championship. 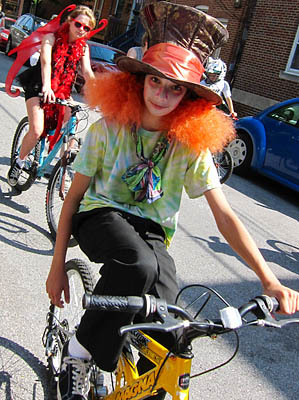 Pit crew were festively costumed as Lewis Carroll characters. Green grass at the Caterpillar’s base concealed pontoons that served it well on the water. 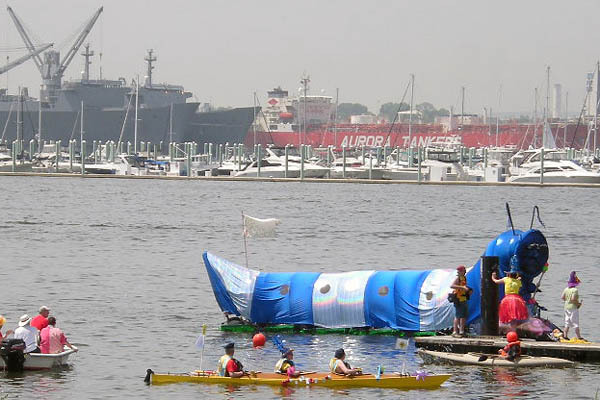 The cargo vessels in the background came first in Baltimore’s history, then the yacht yard, then the 21st century amphibious Caterpillar based on the 19th century tale.